Details about the mission trip appear below. 3. You can eat at ANY Fins location at ANY time OR you can get it TO GO! 4a. IF you're calling for delivery, ya gotta have the physical flyer & hand it to the delivery person (not just your phone) - it's the only way to keep track of those! 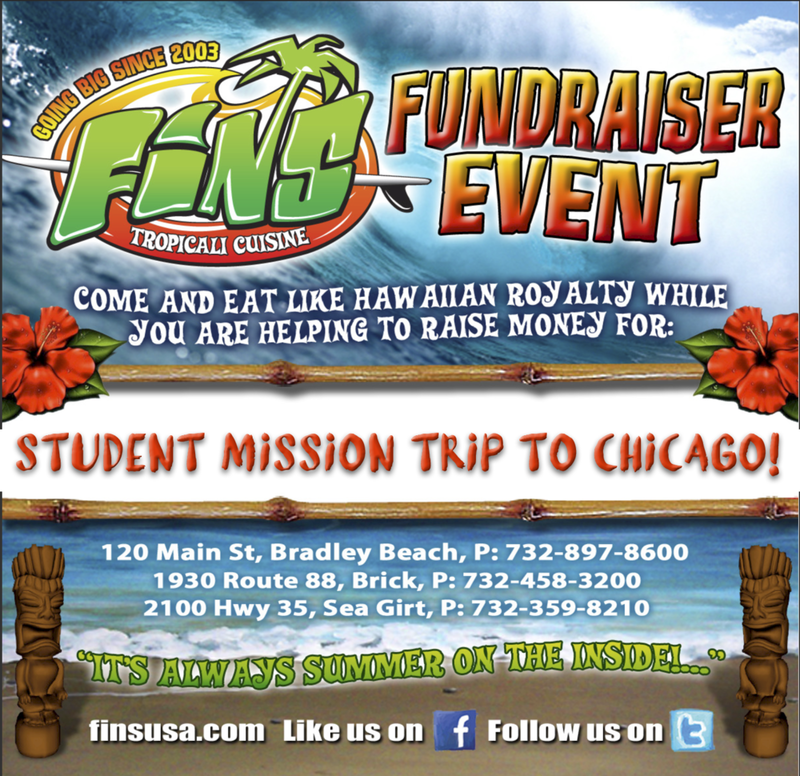 Hope to see you at FINS! A portion of your check goes to St. Paul's Student Ministries, Ocean Grove, NJ. Let's make some Chicago dreams come true! Why Chicago? Looking deeper under the surface, we can see that Chicago is a struggling city. Currently, Chicago Public Schools (CPS) is in debt by 6.3 billion dollars. Because of this, cuts have had to be made in order for children to keep going to school. Over the last year, Chicago has closed 50 public schools due to debt. What does this mean for our youth? Unfortunately, it means that students are having to travel to farther away schools, many times crossing rival gang lines. This brings in more violence to their commute as well as to their classrooms. Through this darkness, though, there is hope. The 2013-2014 school year has held a record high percentage for graduation. There is now a 69% graduation rate citywide! Many of our struggling neighborhoods still have a 10% graduation rate, however we have hope that this number will continue to rise. As you can see, Chicago is a beautiful, struggling city. Through its imperfections, there are numerous glimpses of hope. CSM Chicago is blessed to serve alongside 60 different partners who are working for justice and peace in the city.